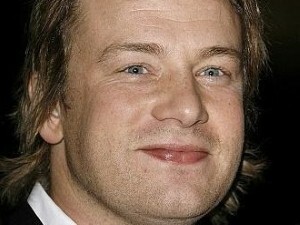 Celebrity chef Jamie Oliver and his wife, Jools, recently welcomed their fourth child, and first son, Buddy Bear Maurice. "I've only just started calling him 'him,'" People magazine reports Oliver told guest host Sharon Osbourne on the talk show Lorraine. "For the last two weeks I've been saying, 'Can you pass him to me?,' because it hasn't quite processed." Baby Buddy joins big sisters Poppy Honey Rosie, 8 , Daisy Boo Pamela, 7, and Petal Blossom Rainbow, 18 months. When asked who chose the kids' unusual names, Oliver said he's not in charge. "Jools is definitely in charge of the names and we're probably quite lucky it was a boy really, because we were out of names for girls," he said. Oliver says that having four kids has been exhausting for both he and Jools, and that they probably won't be adding more kids to their brood anytime soon. "I think that's it, I really do. I've already gone from a car to a bus – I've got a minibus now, it looks like the A-Team or the O-Team has arrived. So if we have one more, we'd have to get a proper minibus," he joked. Oliver's Emmy Award-winning reality series, Jamie Oliver's Food Revolution, has been commissioned for another season on ABC.